Colossus transforms his body into armored steel to become a nearly indestructible force in combat. Боже мой, did we ever need a new Colossus! [insert Statue of Liberty joke here --ed.] The last one was got was movie-based, and before that you're going back to the ToyBiz molds. (Да нет, there was the Marvel Select version in 2012, but let's be honest: Marvel Select is what you get when you can't get a Marvel Legend.) When last we checked in on our gentle ex-farmboy Piotr Nikolaievitch Rasputin, he'd become the Juggernaut, but lost those powers after being possessed by the Phoenix. Like Cyclops, his powers became unreliable after that, so he joined X-Force when Cable found a way to stabilize them. He then retired for a life of peace and quiet, but like most X-Men, he got sucked back into the life. Colossus gets a unique new sculpt - or he would, if we'd gotten this review published before Death's Head II. This is where it originated, though. 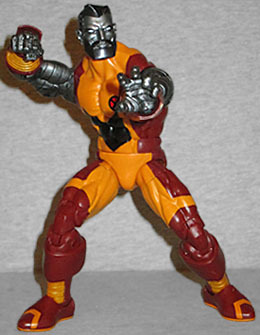 The costume comes from Extraordinary X-Men; it retains Colossus' traditional red-and-yellow colorscheme, but the only skin it leaves bare are the arms - no more needing to hide his thighs behind unstable molecules. He still wears heavy bracers, suggesting the power of his punches even before you catch sight of the armor sculpted on his knuckles. The yellow section on his chest comes to a point, suggesting the triangular tunic he used to wear, then there's a black panel over his stomach before the yellow comes back in for the inner thighs and around the tops of the knees (a nod to his old boots). The colrs are perhaps not as bright as you'd expect: the yellow is tinted with red, while the red is more of a brick color than a true, vibrant hue. The color of his steel skin is also darker than expected, a dim grey rather than bright shiny silver. Does he need to wash that stuff? Or does it reflect his emotional state? Whateer the case, this is a classic Colossus, with the blank white eyes and the flattop hair. 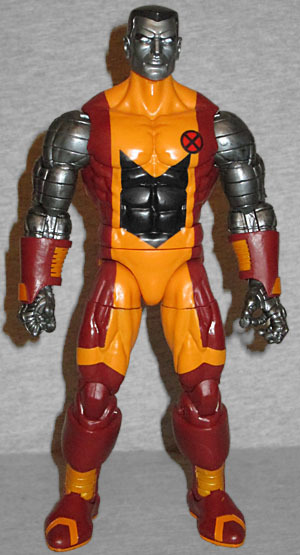 However, like we said, this toy is based on Extraordinary X-Men, and in Extraordinary X-Men, Colossus had been living by himself for a while. Well in that time, he grew a beard, and he didn't immediately shave it when he came back to the team; so when he armored up, the beard armored up as well. Thus, we get a second head, featuring a different haircut and a big metal beard. The toy is very big, more than 7⅝" tall, and is as articulated as any Marvel Legend: swivel/hinge ankles, wrists and elbows; swivel shins, thighs, waist and biceps; double-hinged knees; balljointed hips and head; and hinged elbows, chest and neck. All the joints are sturdy, meaning they'll support the poses you give him. His left hand is molded in a gripping pose - I wonder if you could get Wolverine's foot in there, for a fastball special? Still, this thing is large enough that he really could have been a BAF if they'd wanted to go that route! Colossus gets no accessories, but he does get two pieces of this series' Build-A-Figure, Warlock: the head and a hand. Well, it's a buzzsaw - presumably it replaces one of his hands as an alternate weapon, rather than being, I don't know, a vestigial tail or something. 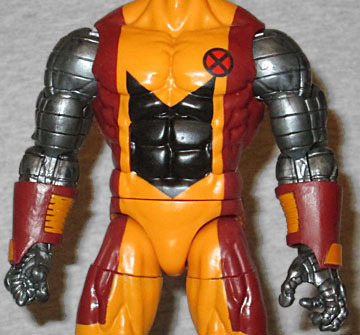 It's understandable why Hasbro chose this Colossus for their lineup: it's a modern costume, and probably would have been featured heavily in the books when they started designing him. And even if a lot of fans would have preferred a more vintage look for their toy, it's not like this one is bad or anything.